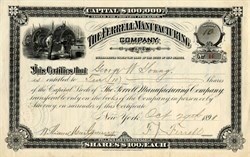 Beautiful certificate from the Ferrell Manufacturing Company issued in 1891. 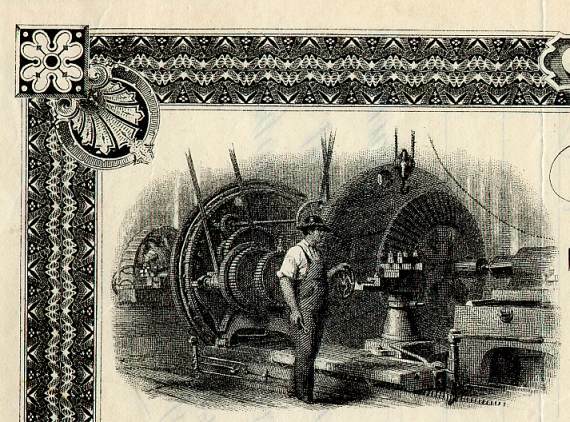 This historic document was printed by the American Banknote Company of New York and has an ornate border around it with a vignette of a man next to large gears and machinery. This item has the signatures of the Company’s President, Frank J. Ferrell and Secretary, William Montgomery and is over 119 years old. Issued to and signed by George W. Young. AfroAmerican Inventor Frank J. Ferrell, of New York, had obtained about a dozen patents for his inventions, the larger number of them being for improvement in valves for steam engines. May 27, 1890 - Frank J. Ferrell, of New York, NY, received a patent for an "Apparatus for Melting Snow" "to provide a simple and efficient means of melting snow; and it consists of a box [preferably made of cast metal]...provided with a duct for heated fluid and openings leading from the duct to the interior of the box...steam is used as the melting fluid"). George W. Young was a prominent New York banker who married Lillian Nordica in 1909.